Spring in the Lowcountry seems to last for about 15 minutes, but summer is endless. 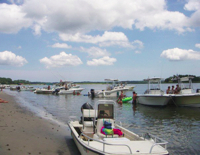 And in Bluffton, summer begins and ends at the Sandbar. To put it in perspective for you, less than a week after our first trip to the Sandbar with friends, my husband and I bought a boat. Two years later I am sans husband, but the boat is still mine. I had heard about it, of course, before I ever set my feet in the hot sand. Until then, I questioned the allure. But I now know that until you experience the Sandbar firsthand, you can’t truly appreciate it. These are those perfect summer days when low tide hits mid-afternoon and the Sandbar appears, creating an island beach party that would make Gidget and Moondoggie proud. You can smell the charcoal, burgers and brats sizzling in the hot summer sun. You can hear the whirl of a blender, the pop of a beer, and diverse music selections jockeying for position. You will see old friends and meet new friends. If it happens to be a holiday weekend you will be tied to many friends as boats snuggle close, moored together along the shore as folks hop from vessel to vessel. And, it makes for good people watching…or at the very least, interesting. A recent expedition included a gaggle of men in Speedos. One can only hope that they lost a group bet and this was their attempt to pay off their debt. If not, well, to each his own, right? Actually, I take that back. If you are in a Speedo, you are putting your “own” out there for the world to see, and is that really fair? I think not. But, I digress. 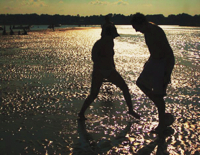 When low tide partners with the early morning sun, it is family time at the Sandbar. Floaties, swimmies, and swim diapers abound. With no real waves to compete with, the Sandbar offers the perfect alternative to the beach. On the back side of the bar, the “pluff mud plunge” offers plenty of entertainment for tweens and teens who can experience a Bluffton mud bath without the spa price tag. Bambino bar is also the ideal time for your four-legged friends to frolic. Early mornings mean fewer people and less chaos. If your four-legged baby is a monster like mine, you will appreciate the light crowd as you try to wrangle your pup away from his new pooch pals. High tide at the Sandbar is for the hard-core enthusiast. In the deep heat of the summer when your backyard is a sauna, you can enjoy the best “pool” party in town as the May River swirls at your shoulders. A couple friends and your floating food, beverage and entertainment station (that’s your boat) are all you need. High tide is quiet time. Adult time. The boats are, for the most part, college student-, child-, and dog-free. If peace is what you seek, hit the Sandbar at high tide. I almost hate to give away this secret, but it doesn’t matter if the tide is high or low, as long as the moon is full. You will sit—with your toes in the sand or simply hovering above the Sandbar—in stunned silence. And, as the moon rises and casts it glow across the river to the bow of your boat, your mind and body will relax, comforted by the rhythmic lull of the river at rest. You will note to yourself that this is the most spectacular sight you have witnessed in the Lowcountry and, as soon as you return home, you will mark your calendar for the next full moon. It’s just that good. Gentlemen, this is a first date that dreams are made of. Believe me! So, I’ll meet you at the bar. You’ll find me on “Just Mine.” Stop by and say hello.